This is my third year of making these calendars as gifts for our family for Christmas. It's a perfect way for me to use some of my scrap paper and embellishments. Each calendar is different and tailored for the person I am giving it to. 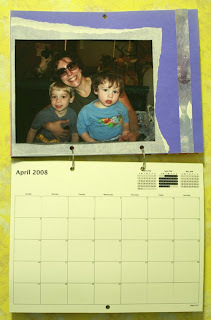 I print out the calendar pages on card stock and adhere them to the photo pages. I use to get them bound at KinKos but when money was extremely tight one year, my friend Wendi gave me the idea to use binder rings. You can buy a large amount of them at any office supply store. I wasn't actually going to make them this year but many people hinted, not so quietly, that they were looking forward to their new calendar. So I guess it's become a tradition. I normally start them in the summer, since I make about 10 calendars I need the time to get them done. And it also makes crafting for Christmas gifts less stressful if I create items throughout the year. I've been using them every year and they just keep getting better. I loved the quotes on my this year! This is one project that has to keep going and going. Just think you have neices that will love them when they go off to college.